As you might have already seen, Bosch has come out with a new 18V wireless battery charging system. 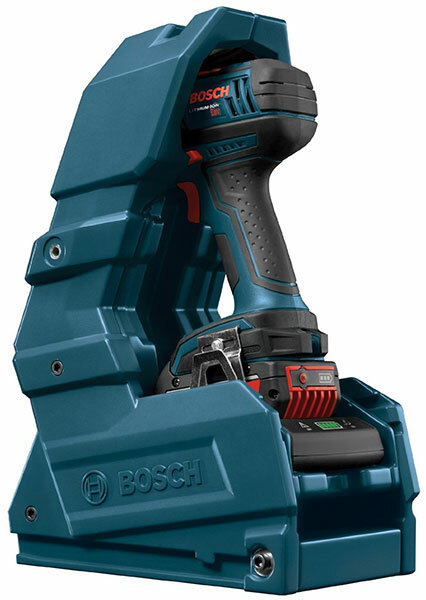 The system consists of an inductive charger, 18V batteries with integrated charging coils, a charger frame, and a large drill and driver holster. I have only begun working with the wireless charging system, but there a couple of quick first impressions that I wanted to share. The system works PERFECTLY. I have only been testing it for a little bit, but it works exactly as expected, with no hiccups at all. Whether the tool is in the holster, or placed on top of the charger in its frame, there were no issues thus far. Grooves in the battery ensure that alignment is quick and effortless. If you buy the holster as part of a tool combo, it only comes with the inserts for that tool, or tools in case of a combo. 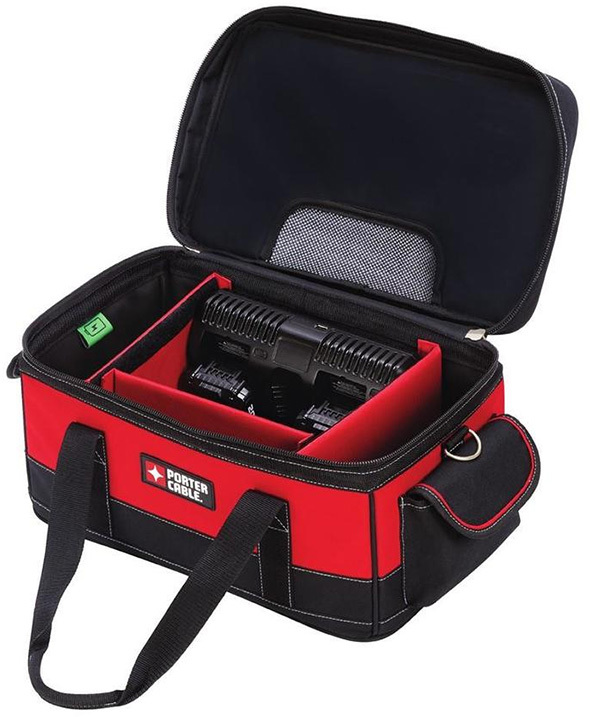 If you buy the holster by itself, it comes with 4 sets of inserts that are compatible with 10 different Bosch 18V drills and drivers. If you want to use two tools, such as a drill/driver and an impact driver or the hybrid impact driver/wrench, you cannot use the same holster without changing the inserts. It might work, but not optimally or with a perfect fit. For example, if I equipped a DDS181 drill/driver and an IDH182 impact driver/wrench with wireless batteries, I would have to by two separate holsters in order to keep them both charged. You cannot use one holster back-and-forth with two tools unless they’re of the same class, such as a compact drill and compact hammer drill. What you could do is place the charger in the frame and use it on a table. Then, you can go back and forth to charge however many and whichever tools you’d like. I really wish that it was easier to use the holster with multiple tools. One could buy and install multiple holsters, but each one is pretty big. Two holsters would be an immense waste of space. Another idea is to mount the wireless charger in its frame and on a surface or wall, but having to charge a battery by itself on the charger sort of defeats the whole purpose of the wireless charging technology. How many users use just one tool? How many use two, such as a drill/driver and impact duo? Those that use just one tool most of the time probably won’t have anything to complain about. But those users who go back and forth between a drill and driver will have to work with a second charger, a second holster with charger, or a single charger and no holster at all. I really wish that there was some type of universal insert, maybe as a separate accessory (hint hint Bosch), so that I could use the holster with different tools interchangeably. Thank you to Bosch for providing the review sample unconditionally. Review samples are typically given away, donated, or retained for editorial and comparison purposes. no doubt this was a cool idea from bosch but like all innovations, the first iteration is rarely the best.. i think the design and functionality of this has a long way to go before it is really a useful option for everyone. i can see it working well for someone who works at a single station all day like in an assembly line type setting. Probably looks kinda cool in a Robocop sort of way in a German assembly line setting. I don’t know how often I use two tools in one location, where I’d want to be swapping them back and forth from the holster. It seems like an interesting, but gimmicky thing for most people. Then again, the only time I really run down my drill batteries is when I’m working on the kind of large-scale project that is away from my work bench. I assume so. Haven’t tried it yet, but these should be compatible with the regular charger as well. Seems like a solution in search of a problem. I just don’t see the fascination with this recharging system. How is it any better than plugging the battery into a charger? Induction is a very smart, efficient way to go with battery chargers. I would suspect that all large lithium-ion batteries should be headed this direction at one point or another. Electronics have been doing it with that “Powermat” device for several years now, and it still makes sense. I DO NOT like that holster thing. That assumes it has to be one particular tool or another. Just a charger, like a flat platform with grooves for the batteries to fit in place, is all you need for an induction system. Then it won’t matter if you’re using a drill/driver style pistol-grip tool, or just decided to leave that battery on a reciprocating or circular saw, and charge it while it’s sitting doing nothing. I’m not a Bosch fan, directly. I very much like Dremel Rotary and Specialty tools. I know this is a QUALITY device, but I still wouldn’t buy it. A DeWalt version, perhaps I might. Induction on the bigger tool batteries would be quite nice to have. But, I suspect MOST of the big manufacturers are going to follow suit with Bosch here, and give Induction Charging a try. It is a very, very good idea. Holster bad. Induction good. 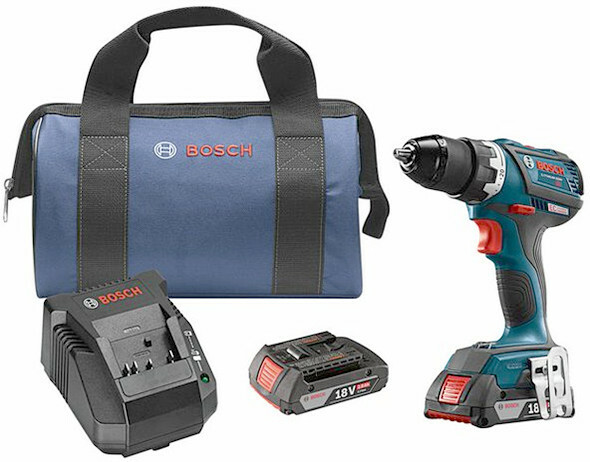 If you like Bosch, I think this might be for you. Just be smart about the things Stuart pointed out, about buying what you need for the tools you use this with. Yes, that’s the frame I mentioned in the post. 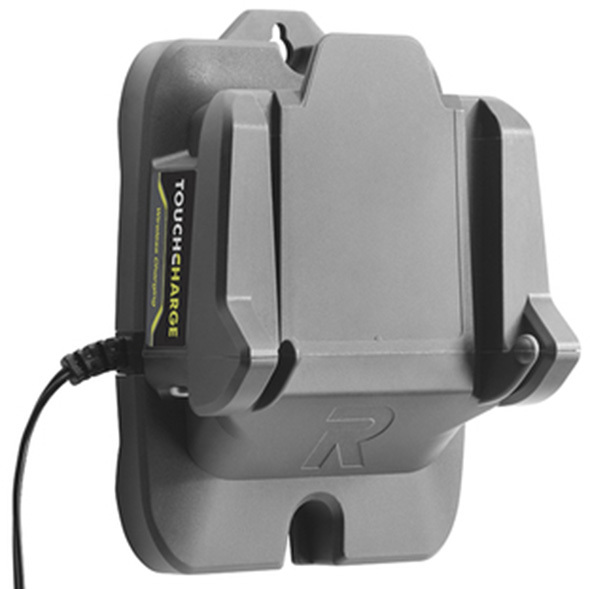 The charger doesn’t have to be used with the frame or holster, but both do enhance the user experience. That’s the flat platform I was referring to as well, yes. The Not-A-Holster charger. It’s all you need. And it’s the kind of thing any tool manufacturer would need if they want to make their own induction-charging battery system. This looks really cool, but how important is it to not have to eject a battery to swap it? And how fast is the charging compared to a standard battery charger? Bosch says that it can reach an 80% charge in 30 minutes. Full charge is said to take 50 minutes. 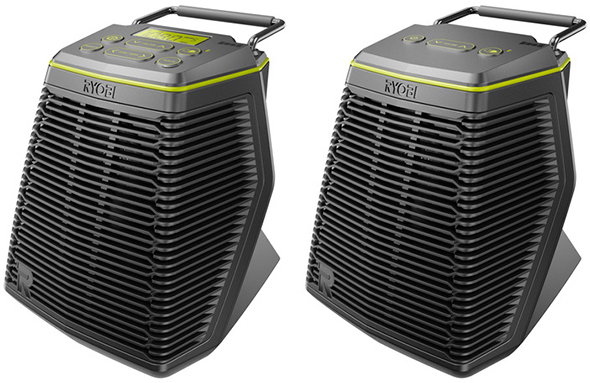 A regular 18V 2.0Ah battery is fully charged in about 35 minutes. Great concept but not for me at this time. The deal breaker are the large tool specific holsters. I do a lot of work that involves swapping a drill and impact driver, or a driver and saw, etc. Instead of buying 2 or 3 holster chargers, I’d rather get an extra battery or two, and just swap batteries in a standard charger. Now, when they come up with a universal or at least near universal charger, I’ll look into it better. One last question, since it uses magnets, is there any fear of interference around metal filings? Suppose someone was using a cordless metal saw to cut steel studs, or had a cordless angle grinder, would the filings all over present a problem? Do the batteries have any residual magnetism in them, that might attract filings? The holsters strike me as though they’re designed for two specific applications. The first is the mobile application, where supporting/cradling the entire tool while the truck/cart moves about helps to protect the system from damage. The second application is ‘blind’ grab and return. Not having used one of these, I can’t say for sure how they are, but a properly designed pistol holster allows the user to quickly grab the pistol and return it to the holster without looking at it. Both of these applications call for tool specific design. Rattling about in/on the charger while driving won’t be a good thing, and constantly missing while blindly grabbing/putting the tool is also a bad thing. A more flexible design using some sort of conforming/springing medium would theoretically allow more different tool shapes to be accommodated, but it might make the grab/put force requirements too high to be practical. Just like to point out to a couple of earlier posts. From an energy transfer point of view, inductive charging is NOT more efficient than plug in charging. The change of energy from electric to magnetic back to electric involves a loss due to resistive heating. One of the more efficient inductive chargers used to charge electric vehicles is only about 86% efficient. EFFICIENT, no. But, mechanically, yes. If you have to disconnect a battery a hundred times, some of the contact material will wear down. If charging it in the tool saves 50 of those disconnects, that is where the savings are. And, yes, Inductive Charging most certainly is about electric coils and a charge. But, sometimes people get confused between Magnet and Electromagnet when they talk about how this works. They’re using a principle of Electromagnetism to Induce a charge in a coil. So, although some old charger systems in the Electronics industry did use alignment magnets, there are no permanent magnets required for Induction Charging. I am unaware, personally, of the actual Gauss reading that an inductive charging system puts out, but it is an Electromagnetic principle they’re using, so if I was to own one of these, I wouldn’t keep the charger near any hard drives or other Magnetically Sensitive items. Not for their regular use causing a problem, but rather if there is some kind of surge, and some sort of act of insanity causes the coils to emit a strong magnetic field at random. It’s not likely, but I’d play it safe if I was anyone buying an Induction Charging system. I would, however, imagine that Iron Filings would have zero effect on the charging process, unless you got it between the battery and the tool, where the contacts are. The field generated by the charger, and the battery itself probably wouldn’t even notice if you had something on the outside of the battery itself. Induction Charging uses pulses of electric charge through a coil, which generates a magnetic field that moves in a certain direction. An induction battery has similar coils inside, that get a charge passed through them as that pulsed magnetic field passes through the battery. The resulting electric charge in the coil charges the cells. The frequency of these pulses is timed so that the coils themselves do not get overly magnetized, but the field they generate still induces a charge. I’m with Ed Y here, just filling in some clarification and background info. This brings up a question: what usually wears out first in a battery pack – the contacts, or the battery cells? Although you might save mechanical wear on the contacts, inductive charging is a less efficient means of charging battery packs. The battery packs charge for longer. There is also heating in the coils adjacent to the battery pack, which could affect the battery cells over time as well. I have a Motorola Droid Maxx. When I first started using it, the battery life was incredible. A lot of the capacity is gone. Maybe Motorola used a lousy rechargeable lithium ion (or is it lithium polymer?). Or maybe the longer charging every day via the inductive charger is what degraded the battery charge capacity after only 14 months. I hadn’t seen this much loss in capacity in my previous 2 smartphones. As for magnetic interference, much of the magnetic force will be in the direction perpendicular to the coils, and so it will mostly be between the charger and charging battery. I don’t think you’ll see measurable magnetic forces external to either the charger or battery, and so I don’t think there’s a risk of damage to magnetically sensitive equipment. There shouldn’t be a surge either, and if there were, the magnetic force lines will still be mainly perpendicular to the coil. There shouldn’t be any errant magnetic forces, as I’m sure there must be a handshake between charger and battery before things get going. My cell phone (LG G2) has wireless charging. While its nice to just plop the phone onto the pad and get a charge, it generates a fair amount of heat…especially if the battery is very low. Im not sure how warm/hot the Bosch chargers/batteries get, but it would definitely be something to look out for. Im still not convinced this is a good use of the technology….too much capacity and cells to recharge. My cell phone has a very thin built in 3Ah pack….I can only imagine the logistics of keeping a large 18V+ 4Ah+ pack charging wirelessly without wrecking the life of the pack. I need something like this for the range – plop my pistol in the holster to re-load. For tool-use….meah. I love how Bosch keeps pushing the envelope, though. I can see this being a boon in a production environment, where one works inside a limited area, using the tool for a specific purpose for an entire shift where having a conventional battery and charger would mean pausing to swap batteries around. The tool will always be getting a charge when set in the holster, batteries won’t walk off and the holster/charger becomes the storage point for the tool. For me, it just doesn’t make sense for a couple reasons. First and foremost, I rarely single-purpose my drills like that nor do I remain in one particular area. Second, with the 4.0/5.0/6.0 battery packs along with efficient brushless technology becoming commonplace, I can get all-day runtime in most cases with a single battery pack, and depending on the task, the same battery will often have plenty of power left over for the next job or two. Early last year I picked up a Milwaukee Fuel 5″ deep cut bandsaw. It has been used for dozens of projects, from cutting lots of rebar for one project, conduit, allthread and Kindorf strut for another involved project, a couple automobile exhaust remakes, many other single and multiple cuts along the way, plus demonstrations for friends and just playing around, and it still has the first 4.0AH battery I initially charged and stuck on the tool, which I believe still has two bars of power remaining after more than a half a year. That’s not only insane compared to early NiCd cordless tech I was immersed in, but it’s been a dream come true for me. No more worrying that a battery pack will be guaranteed dead if the tool hasn’t been used in a couple months, but the LiIon packs don’t require me to rummage through the big cabinet taking all the packs out of the tools that haven’t been used in a while to charge them up by the couple dozen. The lithium packs are happiest sitting around with partial, mid-level charges anyway, giving them the longest life possible. Since the first LiIon tool I’ve gotten (a 10.8V cordless Dremel sometime near 2000) I have yet to have a LiIon pack give out like so many NiCd packs have in even less time. LiIon chemistry changed the cordless tool category in amazing ways. I can see the inductive charging system having several benefits. The battery and tool remain always ready to use with the battery topped off. The tool, charger and battery don’t have to endure constant insertion and removal to the point where the contacts begin to wear and become unreliable, something that can be common in production settings. The batter can even be permanently affixed to the tool if the environment somehow requires it, the battery being easier to steal than the entire tool, or placing less of a workload on fixed-skilled workers also having to be responsible for maintaining the tools in addition to their work. In particularly dirty environments, keeping the battery and the tool together at all times prevent debris from entering the battery interface in the tool and the charger. The tool holder also becomes a safe place to store the tool in between uses. Stuey, since you have this setup, what sort of clearance is given to storing the tool in the charger/holster thing with a bit in place? Howbout if a rather large bit such as a hole saw is in the chuck? How much room is there in that area of the holder to accommodate this? Having to remove the bit every time the tool needs to be charged can be more of a hassle than taking off the battery. I know the holster piece can be removed and the drill placed flat on the charging base for charging, but that sort of negates the foolproof benefit of being able to drop the tool into the holster where it would be more secure (and perhaps even fixed onto a bench or cart) instead of sitting on the base where it can easily be toppled over. With the hybrid impact driver/wrench, you get about 2″ of circular clearance, maybe a little less. Drill bits and screwdriver bits shouldn’t be a problem, although longer bits might prove to be a safety hazard if the holster isn’t positioned such that bits would face away from open or user-exposed areas. Hole saws are tricky. There will be different clearance with different tool inserts, which are matching pairs. When combined, an insert is donut-shaped, if that makes sense. So no, certain bits and drill bits do NOT have to removed every time a tool is placed in the holster to charge. Wide bits, such as larger diameter hole saws (maybe 1-1/2″ and larger) or large spade bits, might have to be removed if a holster is to be used for charging. But I supposedly saw some stuff where they claimed that with the vacuum being a SEA exclusive tool, it had some issues where the wireless charger would cause it to unexpectedly turn on. The manual for the wireless charger specifically says not to attach tools to it when the frame is mounted vertically. That’s not a comment about the unintentional activation, but probably about a weight limit. Er what if I am heavy use and want to have spare battery charging while I am using the first one. Why on earth would I want and induction charging station that I put the whole drill in….. It might be better to think of the wireless charging products as just another power tool that offers functionality you might or might not need. The bosch 18v 4,0ah “wireless charging battery” is bigger and heavier + 200Grams than the normal battery 18v 4,0ah. (so no thanks “wireless”). Does anybody have any idea if Bosch make a job site radio to fit these new wireless charge batteries because they are a slight different shape to the original normal Charing batteries. Does this work with all 18v Bosch batteries. I have a number of batteries that are 2 or 3 years old. will they work with the wireless charger? No. The wireless charger only works with Bosch’s wireless batteries.